“We are delighted to align with CMSA, the national leader in standards of practice for case managers,” says Edward Hu, MD, CHCQM-PHYADV, President of ACPA. 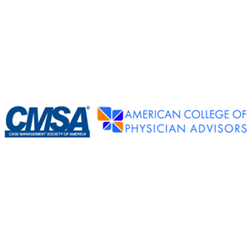 The American College of Physician Advisors and the Case Management Society of America are pleased to announce an alliance to support the growth and education of case managers and physician advisors. The collaboration is a natural one between the oldest and largest case management membership organization and the only physician-led, non-profit, physician advisor organization. Both ACPA and CMSA are dedicated to strengthening the U.S. healthcare system and enabling a workforce that is ready to meet today’s healthcare needs. The roles of the case manager and physician advisor are naturally paired. They work shoulder to shoulder every day to improve patient outcomes, ensure compliance, and to deliver value to patients, providers, and payors. This alliance will provide enhanced opportunities for education and professional growth through shared vision and collaboration. The results will benefit members of both professional organizations. Look for additional information on this collaboration in the coming weeks on the CMSA and ACPA websites.